Even before I can catch up with what I’ve read from Janette Toral’s book, Blogging from Home, which I bought a couple of weeks ago, comes more info from her Twitter account (@digitalfilipino). This time, at least, I got “fresh” updates and was able to immediately try both of it. 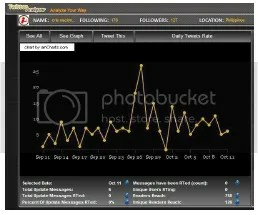 Janette Toral shared the following cool Twitter tools that tracks (or stalk?) a user’s Twitter activity. Here’s one coming from http://www.twitteranalyzer.com which perfectly reflects the surge of my Twitter activity at the height of typhoon Ondoy. I was among those who felt hopeless and guilty about not being able to help the typhoon victims as news about them appear on TV and on Twitter-verse. For those stuck at home, like me who is lucky not to be affected by the flood, the only contribution is to spread via re-tweets (RT) the information coming from those on the field like media men, public officials, and celebrities whose network of tweeps help spread the critical info, updates and pleas for help. Re-twitting somehow lessened the guilt. Twitteranalyzer also shows indicators like who mentioned your tweets, who’s tweet you have RTed the most, trending topics, etc. This next one is by http://www.tweepsinfo.com. 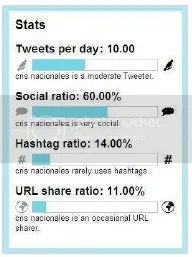 It’s a little bit simpler than twitteranalyzer but shows informative data as well. What I find amusing though is that it indicates how social a user is. It say’s I’m 60% social. Hmm. What does it take to be 100%? Let’s see in the next days to come. Twitter, here I come. Bombarded by a neighbor’s videoke session and a boring new Pinoy Big Brother season, I just realized that I was finally finishing off the last of the chocolate balls I’ve brought along with me from last Thursday’s group session at the Kho’s residence. Now, I’m back to having the regular Hany chocnut for dessert. I’m also back to my regular Twitter and Facebook post personality because last week, due to the seriousness of what happened after typhoon Ondoy’s widespread destruction, I made the following commitment on how to behave online during a disaster. Other than sorting and donating some of our used clothing—including our baby’s—and some other stuffs, I was among those who made good use of Twitter to disseminate critical information coming from agencies such as the Philippine National Red Cross (PNRC), government officials and media personalities who are also on Twitter. I am fascinated by the fact that this microblog, meant initially for socialization, getting updated with what celebrities as well as ordinary folks are currently doing, can become a very helpful communication tool during a disaster such as typhoon Ondoy. It’s just a pity though, that while others are trying their best to extend help however they can, some didn’t spare the opportunity to send spam by latching into critical hashtags. The problem with technology nowadays is that the rate of how information is exchanged back and forth is so quick that it is easy to spread something like a gossip or false accusations within seconds. Take for example, the case of a particular Jacque Bermejo, who in the midst of the overflowing sympathy for those affected by typhoon Ondoy, allegedly posted a demeaning remark on her Facebook status. In a matter of hours, hundreds pounced in (unfortunately, I was among them) to give her their piece of mind—rough ones, mostly. A couple of days later, ANC Dubai interviewed Jacque Bermejo and according to her, it was a hacked account which she has already filed a complaint with the proper authorities abroad (and I’m assuming that includes Facebook admins). Another victim of this split-second social network mobbing is the President’s son, Mikey Arroyo, whose hazy picture appeared posted in Facebook and Twitter showing him in a liquor section (according to report was in Rustan’s department store) at the height of typhoon Ondoy. If it was him or if it was taken while everyone’s busy helping out those impacted, I’ll let it pass, I give him the benefit of the doubt. I’m one who would readily type and send anything humorous as soon as it pops in my mind. Although I have limits to what I send (for one, I haven’t sent sexually explicit jokes), I realized that since I don’t personally know well all of my Facebook or Twitter contacts, whatever I’d send especially during a crisis might be misconstrued as insensitive or offending, thus until yesterday I refrained from doing such. In fact, I even skipped sending shoutouts of the ingredients I needed for my virtual Restaurant City game. Just imagine how one would feel when he opens his Facebook to check on relatives and all of a sudden he sees one of his best friends posting jokes or playing Mafia Wars or Resto City? Go figure. I’m now looking at, finally, the much awaited draft of my Mandyn group’s presentation for Thursday. That means classes will resume this week starting tomorrow. It also means that life will be back to normal. Well, at least for those who weren’t affected by typhoon Ondoy or typhoon Pepeng. Sadly, while we all move on as if nothing happened, some even at this time haven’t even eaten regularly yet while others still try to accept that they’ve lost everything they used to have. So wouldn’t it be nice if we all still spare a thought, pray, and share something more for the typhoon victims? I’ll try my best.